Regular, Super or Super Slim? 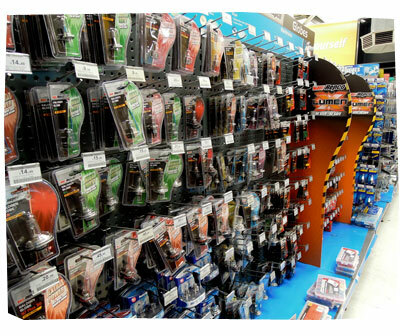 So my husband asked me to pop into the “car parts shop” to buy a light bulb for our car’s rear brake light. You want me to go where? To buy what? This week I want to share the next item from Hello Parry that I’ve fallen in love with – this Poppy Laser Cut Midi Skirt. I don’t own very many midi skirts or circle skirts. So it was a refreshing change to my usual dressing. Circle skirts (or full/flare skirts) were popular in the 50s and usually worn with a net petticoat. The name came about because they were made from a single, circular piece of fabric. They are usually fitted at the waist, giving the wearer an accentuated hourglass shape; hence the style nods to classic ladylike sophistication. THIS skirt is really good quality and made from a lovely thick, strong, soft, cotton fabric. The pleats are natural and flattering. And there is a tulle netting underneath that keeps the skirt in a flared shape. It’s really pretty! I’m wearing a size XS. Since the skirt is flared and quite ladylike, I wore a tight crop top and sneakers to keep the outfit, balanced, casual and fun. Right now, I want to show off how easy it is to wear midi skirts (especially in this circle/flare style) for everyday wear, using typical tops that I find in my wardrobe. I’m wearing a loose slouchy singlet tank top (from Birdsnest), tucked into the skirt. I wouldn’t wear a top that is untucked, as I’d lose the shape of my waist and I’d look like a tent. And I’m wearing classic, pointed toe, suede pumps to match the ladylike look of the skirt. Mine are by Acne Studios from Forward, but there are lots of good quality pumps (that won’t make your feet ache) at reasonable prices over here. Here I’m wearing the skirt with a $19 slouchy boyfriend tee from Sportsgirl! I tucked it in in a messy way and kept it loose. The overall outfit, still looks nice, relaxed, not too girly, and a bit polished. Hope you’re also inspired to try out a midi skirt! Happy shopping! 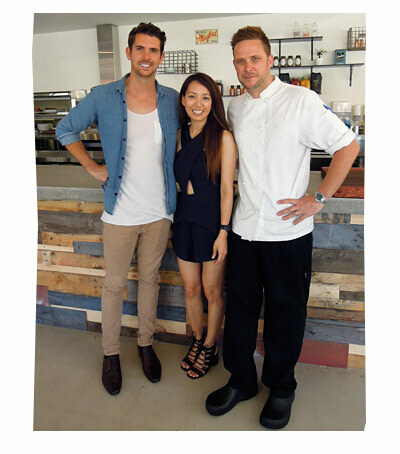 I was invited to the launch of May Street Larder, a brand new cafe in East Fremantle, by the same people who founded the beachside restaurant Bib & Tucker : Eamon Sullivan (the Olympic swimmer) and chef Scott Bridger. 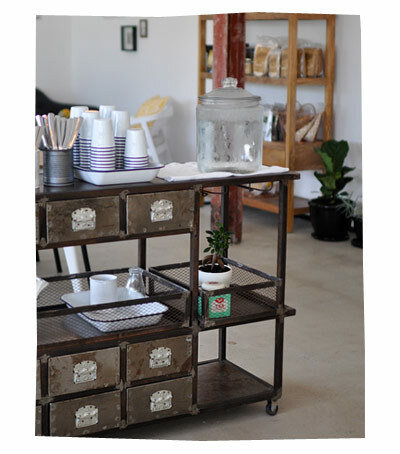 The cafe is focused on clean, healthy eating – right up my alley! Think raw, vegan, organic, paleo dishes with lots of salads and superfoods – but with a few kitchen favourites like slow cooked pork, slow cooked lamb and house smoked salmon. Yum! They make everything from scratch (or sourced locally) using old-style cooking techniques, like fermenting, pickling and preserving, but with a modern twist. I saw homemade pickles, jams, breads, tomato sauces, sweets, sodas, honey, cured meats and smoked fish. I turned up to the event early and managed to snap a few photos of the interior before the guests arrived. The cafe was lovely and spacious! There were lots of tables and seating, and even a little lounge area with a cute couch and lounge chairs for maximum chillaxing. There was tonnes of natural light streaming in from the big windows, bouncing off the subdue colour palatte and casting a modern freshness into the space. 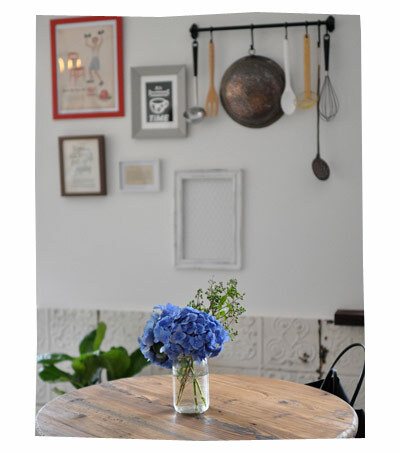 I loved the eclectic mix of antique collectables, natural surfaces, and random kitchen objects with old-world details. During the launch, the kitchen offered us a special kind of menu sampler, where we could mix and match various proteins and salads. 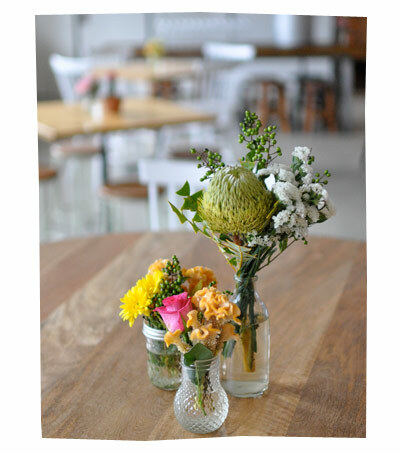 They had all the food lined up at the counter, we could select what we wanted and it would be piled onto our plate – mess hall style! This is not the usual menu and eating format though. When it was my turn to choose my food, I apologised FIRST to the waitstaff (which is never a good sign for them, I’m sure)… then I asked them *ever so* politely if I could have TWO plates and if they could arrange TWO meals nicely, so I could photograph them. Or maybe I could arrange it myself? With a spare fork? Could you please get a spare fork for me? Can you put that piece of trout just off the centre of the plate? Can I have THAT potato instead of this one, because that one looks nicer? Oh you put too much green on the plate, it looks off-balanced, could you take some off? I’m sure she was thinking – CURSE THESE BLOODY FOOD BLOGGERS! Thankfully Scott, the head chef, realised what I was trying to do, so he cut in and worked his cheffy magic. He plated it up beautifully! Thanks Scott! 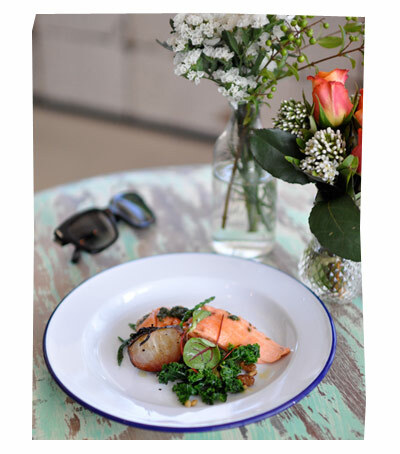 The dish looked great – balanced, not too fussy, neat but still with an accidental cool to it, haha! I chose the house smoked trout and some kind of kale salad and root vegetable… Not sure exactly what I had, but it tasted really good! So fresh, tender and “clean”. This was my second plate. 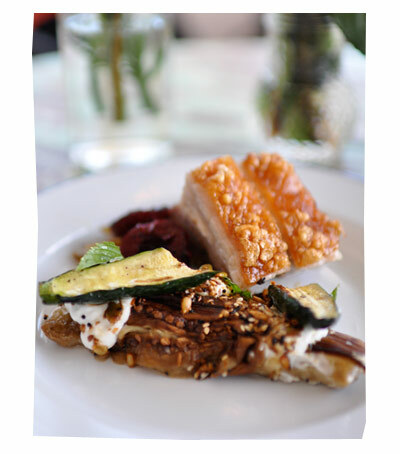 The slow cooked pork and CRACKLING was amazing!! The roasted veggies were lovely too. 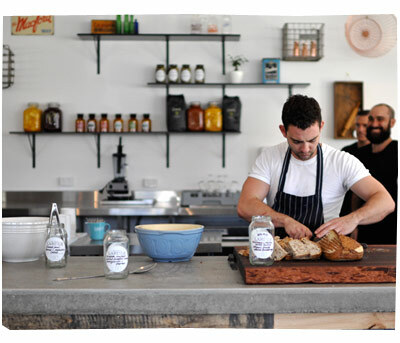 May Street Larder is the first and only place in Perth to offer CocoWhip. It’s made from natural coconut water and a coconut probiotic (that’s it! ), and churned into a creamy, silky, smooth, cold, kind of soft serve. It tastes a bit like a mild coconut sorbet, but much lighter, smoother, and with significantly less sugar than any sorbet I’ve ever tasted. It’s sugar free, 99% fat free, gluten free, dairy free and lactose free. 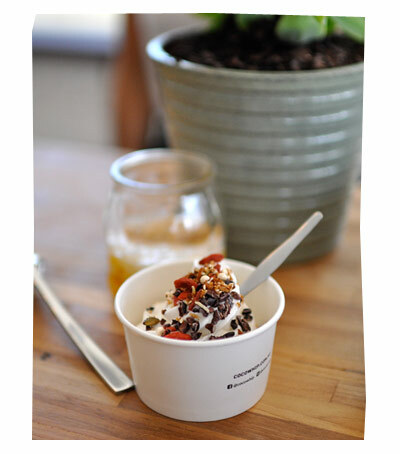 It’s also served with goji berries, cacao nibs and a lupin granola. It’s the hippest little vegan soft serve I’ve ever seen! Big thanks to Eamon and Scott for the invite. I’ll definitely be bringing my girlfriends back for brunch!